A 'Fresh Air Express' at Challow on 6 July 2015. 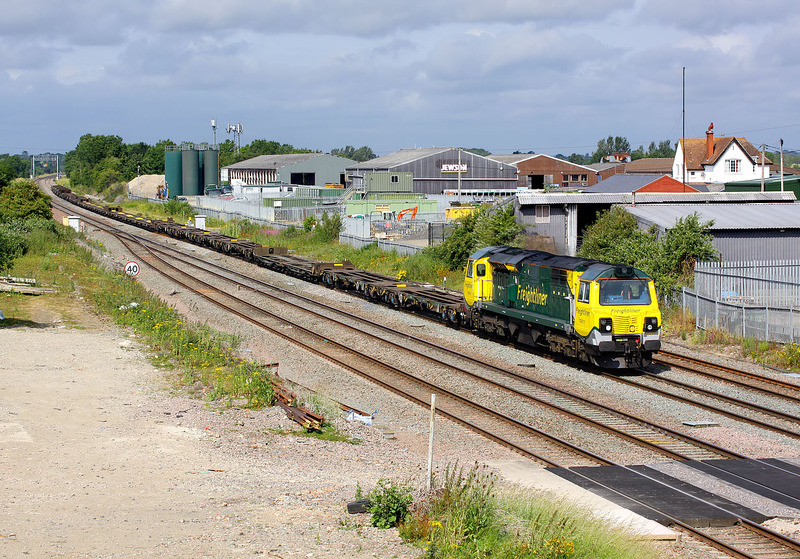 There is not a single box on the 4O59 08:00 Wentloog to Southampton freightliner, as it passes Challow on 6 July 2015, with 70011 in charge. It was a poor morning for freightliner traffic, as the regular 4L31 09:03 Bristol to Felixstowe North was cancelled. Whilst I don't normally like photographing very lightly loaded freightliners, with just a few widely spaced boxes, the sheer novelty of this completely empty train was worth recording. The Met Office had been quite correct with their forecast on this occasion. They had predicted a sunny morning, giving way to clouds by 10:00, to be followed later by rain. It is three minutes after ten, and just look at that mass of dark clouds rolling in from the west!